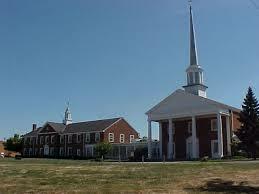 Anderson Hills United Methodist Church is a vibrant church supporting a variety of ministries and a preschool program. 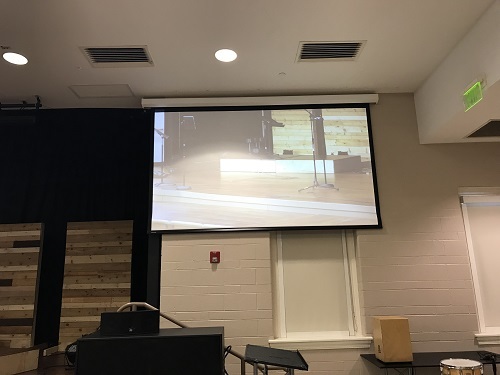 When the church was expanding their contemporary worship space they contracted with Sound Concepts to design and install new, high quality, sound and presentation systems in the new space. 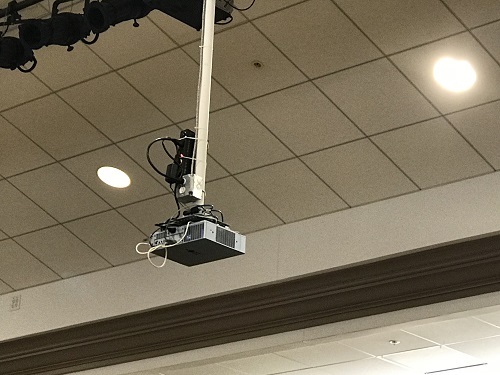 Following is a description of the systems in the facility and the recent addition of a multi-camera video system along with live stream capabilities. To visit the church's web site, click on the picture above. 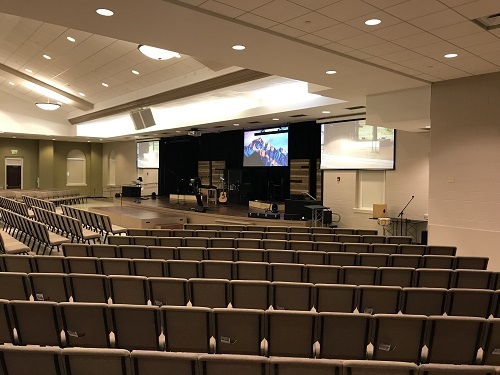 The newly renovated room features a two level stage and fully adaptable seating to allow banquet events as well as a worship experience. Three screens assure that all persons in the room can see the presentation content clearly. 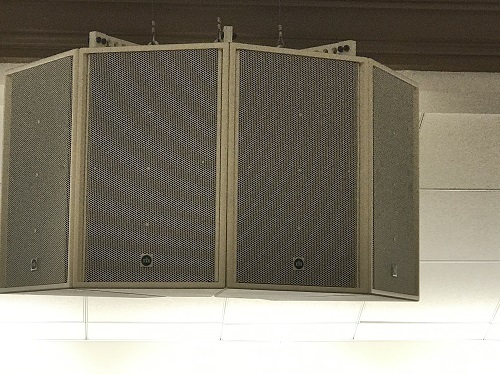 A central cluster speaker provides even sound distribution throughout the space. 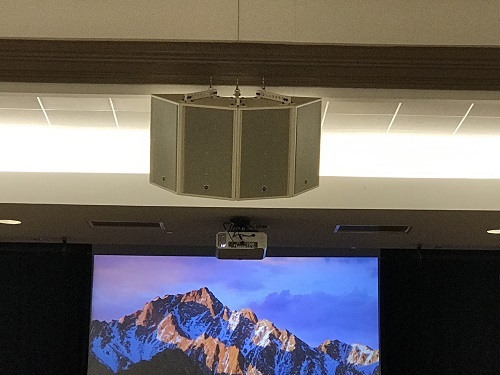 Due to the configuration of the ceiling area above the stage, the speaker cluster was in the direct path of the cone of light from a projector mounted in the rear of the room. 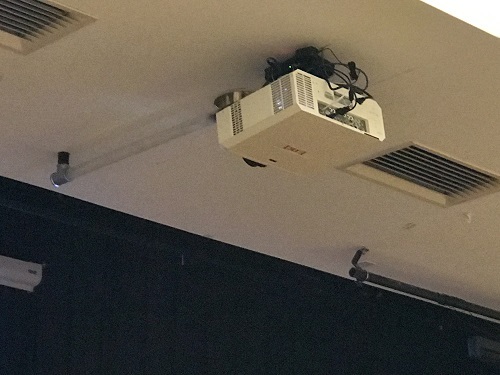 The compromise was that the projector would be mounted from the ceiling behind the speaker. Unfortunately this configuration allows the projector to be visible from the audience seating but does provide a great image on the screen. The projectors for the side screens are mounted in the back of the room and out of view by the seated audience. The side screens are motorized allowing for them to be raised when not in use. the lights directly above the screen are turned off during an event when the screens are being used eliminating the reflection. 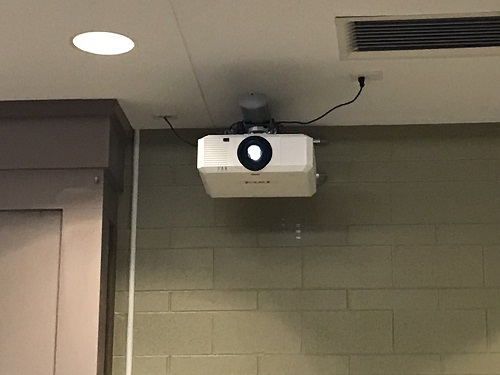 To provide a confidence image for the talent, a rear firing projector is mounted to display on the rear wall of the room. The image shown here can mirror the screens in the front or contain different content needed as cue points for the talent. A raised control booth for the presentation tech as well as the lighting, video control and live stream provides a secluded space for the technical personnel to work. The main speaker cluster is a Renkus-Heinz two-way system comprised of four cabinets computer modeled to work as a cohesive unit. Two, Renkus-Heinz dual 18" subwoofer cabinets are located, one on either side of the stage, provide adequate bass for the room. Four Renkus-Heinz cabinets provide front fill sound for the persons in the front rows who are just outside of the direct pattern of the cluster. 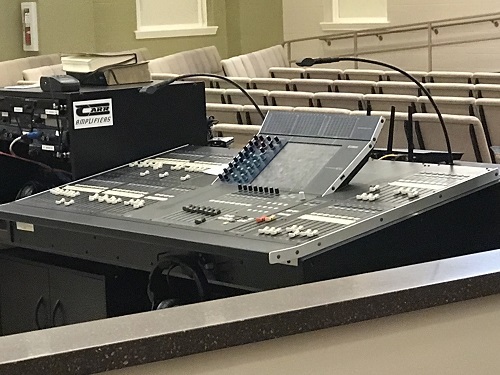 The front of house console is a Yamaha M7CL-48 digital board. 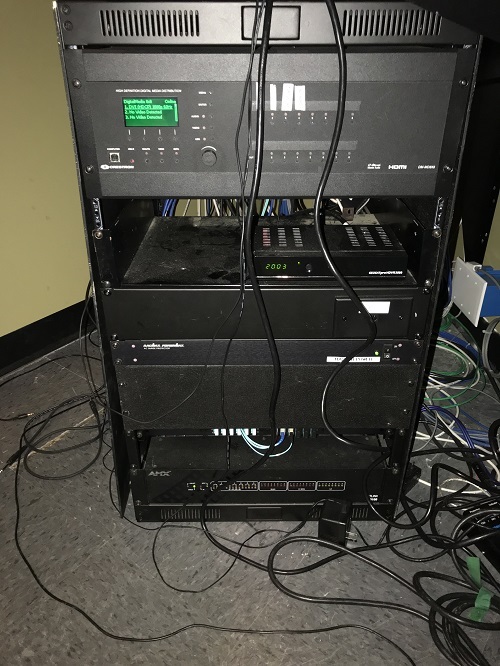 The wireless mic systems are housed in a separate rack in the sound booth. 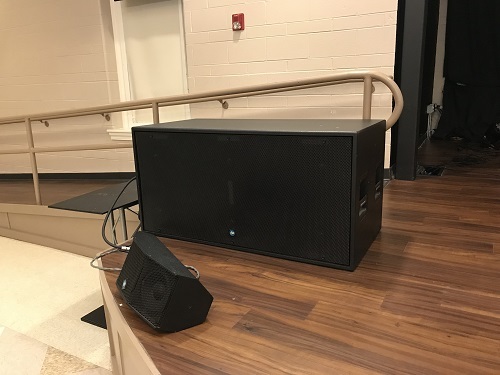 The audio workstation is strategically located in room to allow the mix engineer to hear the sound from the speakers and the room and provide a quality mix for the audience. 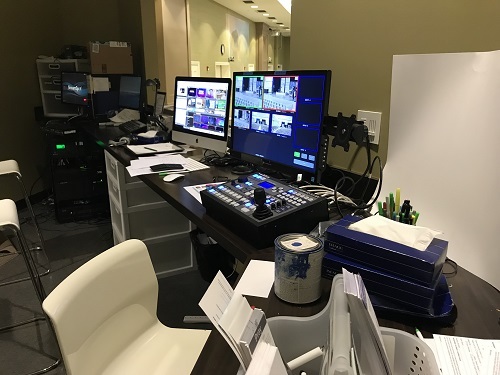 Video switching and camera control is performed from a workstation in the Video control booth. 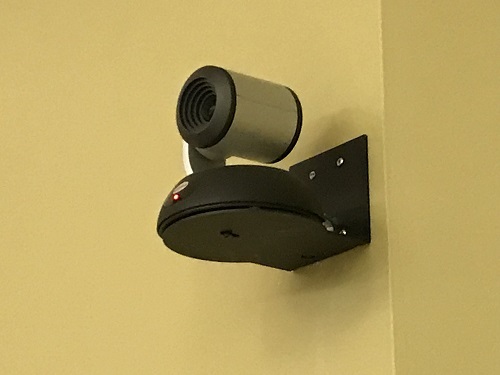 Three High Definition Vaddio PTZ video cameras are located across the rear of the room to provide angles for any shot that might be required. 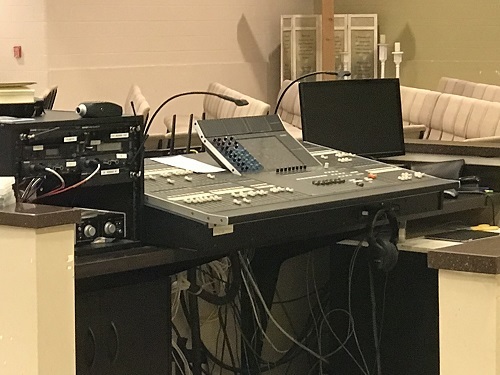 Additional wiring is provided to allow addition of two additional cameras, one located on the stage and one that can be used in or near the audio booth. Also located in the Video control booth is the live stream workstation. 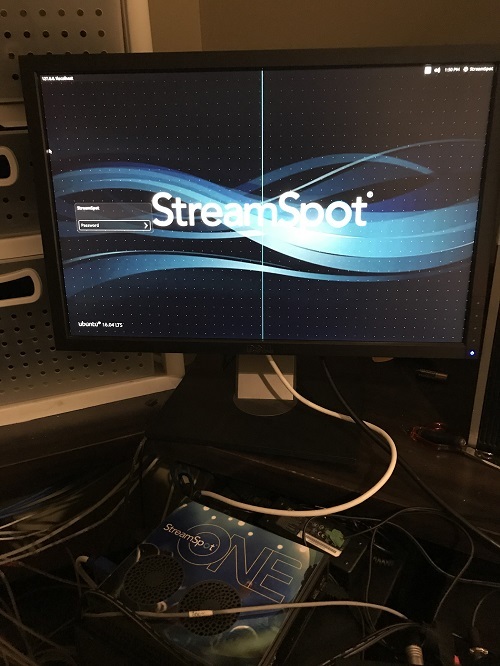 Audio from the main mixer and video from the Vaddio Switcher are sent to the internet through this workstation. 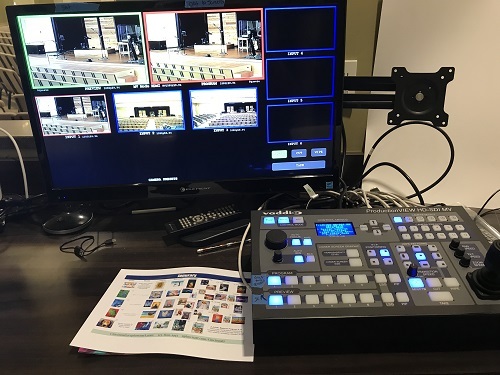 For more about our live stream package click the button below. 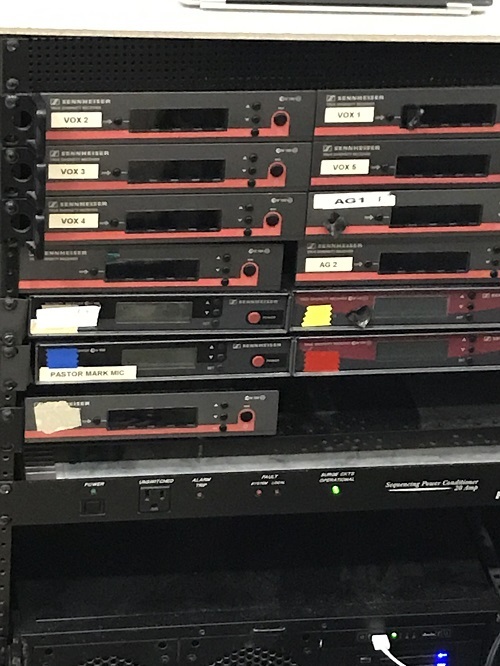 A Crestron matrix switch provides routing of audio and video to other spaces in the building. The service held in the traditional Sanctuary can be fed to the Fellowship Hall and a service in the Fellowship Hall can be fed to the Sanctuary. 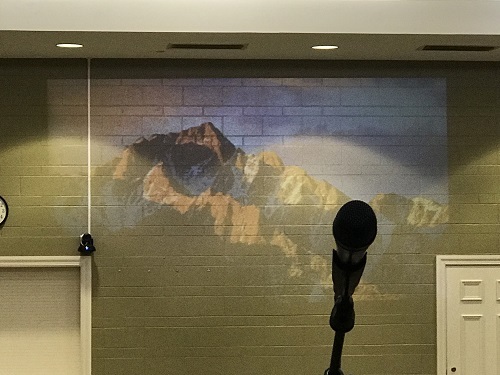 There is an additional meeting location called the Connections Center that has and audio and presentation system and the services can be sent to that location as well. 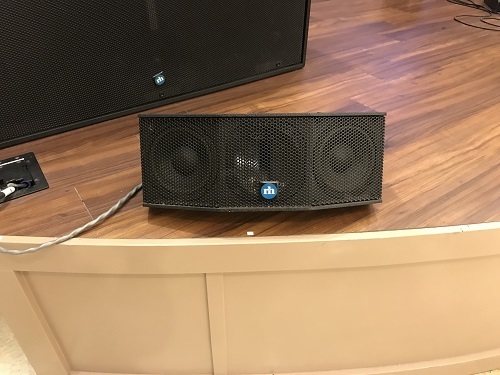 Additionally the Crestron unit allows the engineer to choose what content is sent to the individual projectors in the room Any combination of sources can be sent to any combination of displays using the matrix switch. A limited number of combinations can be routed through presets on a wall switch but using the manual routing feature on the system any input can be sent to any output or combination of outputs. and any combination of inputs can be routed to any combination of outputs.